SANTA MONICA, California — A local California Marine Corps Veteran installs American flags for homes to help instill pride and patriotism into his own neighborhood. He hopes his mission will inspire veterans throughout the United States to do the same. “Having veterans do this gives them a sense of meaning. We all fought for this. It’s not just going to Home Depot and putting a flag up yourself. 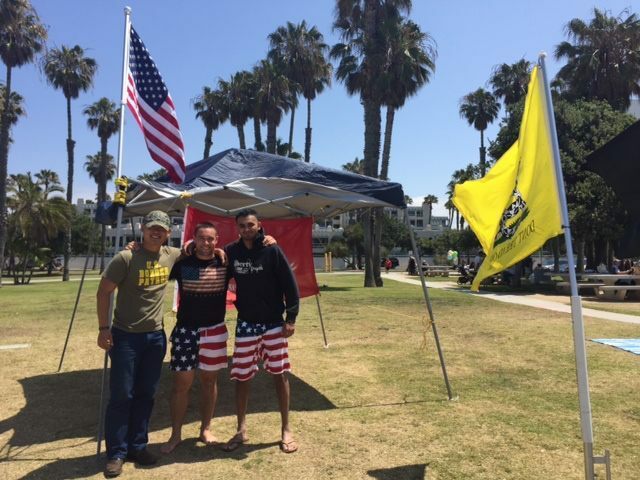 You’re giving a veteran an opportunity to put a flag up for the country they fought for,” George Bukhin told Breitbart News. Bukhin told Breitbart News that his quest to bring the American flag back to the fore began when he decided to hang “Old Glory” on the exterior of his apartment several weeks ago. Out of respect for his older neighbor, he let her know his plans. Her reaction was an unexpected one. “She told me she didn’t like the American flag being up because she felt it was divisive,” Bukhin told Breitbart News. He proceeded to place the flag up anyway. Last week, both he and the American flag became victims of vandalism. Not only was the American flag stolen, but the brick it had been nailed to was physically torn out of the building rendering it damaged. “It took a lot of effort for the person to tear it out,” he said. That’s when Bukhin realized that “the only way to overcome people who disagree with you and to fight the dislike of our flag is to win by the numbers. You don’t like my one flag? Great. I’ll get the whole neighborhood to install our beautiful American flag everywhere.” He says “raising the American flag should be the norm. Bukhin, who is Jewish, immigrated to the United States with his family from now war-torn Crimea in 1991. But his love for America can be felt from thousands of miles away; something he attributes to his dad. His hope is to get veterans involved with this great endeavor and have them help other veterans to start putting up American flags in their own communities. For the time being, his services are being offered in Santa Monica, but he anticipates this sparking a movement which will make the service available throughout the United States. If interested, visit his website here.